It is said that upon two of the world's commercial industries, every other form of activity depends. These two fundamental industries are agriculture and mining. Statisticians prove the above statement and the further fact that these two dissimilar branches of civilization's business are so closely related as to be quite inter-dependent. Strides are made by one of these industries only when advance is noted in the other. While it may not be possible to explain just why this is so, it is worth our attention to consider some brief figures that show this condition of affairs. The agitation conducted during the past few years, leading to the establishment of a Bureau of Mines in the Department of the Interior, attracted the thoughts of many students of economics who had not previously or seriously considered the industry of mining. The delivery of brilliant addresses showed that mining had been unjustly retarded. While agriculture has for years been fostered by the government and with remarkably satisfactory results, the great sister industry has been required, until recently, to struggle along without any governmental recognition in the matter of support. Yet it has forged its way in unmistakable terms of progress and there was an insistent demand, among those men particularly interested in the welfare of mining, for the protection and the assistance which would and has now come through the establishment of a governmental department. Various states have long recognized the importance of the mining industry by the establishment of departments. The Canadian and Mexican governments maintain very creditable Departments of Mines. It was but a question of time until the shortsightedness of our politicians (not our statesmen) was revealed, and the mining industry has now come under the auspices of a federal department. Taking the world as a whole, it would be hard to conceive the sum total of annual mineral productions. The middle of the past century seems to have been a critical period in the mining industry of the earth. There was a great impetus given to mining by the greed for gold which caused the settlement of our western states and the Australian states, as already mentioned. But there gradually followed the opening up of mining in many other and hitherto unpopulated and uncivilized portions of the globe. The search for gold was successful. Prior to 1850, the production of gold had not kept pace with the increase in population. Soon, however, it began to take leaps, in almost geometrical ratios, until, by 1900, the annual production of gold throughout the world was some 2,200 per cent. of the production for 1800 (as nearly as may be ascertained). The 1900 gold production was of a weight of about 400 tons, in round figures. During 1911, the world produced approximately $470,000,000 (about 779 tons) in new gold bullion. It is estimated that with a continuance of the remarkable progress, the next 20 years will duplicate the amount of gold now known in the world. This means that the amount of gold which has been accumulating from mining during the world's ages will be doubled during a fraction of our lifetime. This is significant of the world's progress, in gold mining, at least. It seems coincidental that the rush for gold in 1849-50 should have been almost simultaneous with the remarkable development of our other mineral resources. All of our great discoveries of coal, oil, silver, iron, lead, copper, and zinc can be said to have followed closely upon the discovery of gold in California. It is not supposed that the discovery of iron in northern Michigan in the early eighties had any connection with the "Pike's-Peak-or-Bust" expeditions, nor that the opening and development of the vast coal beds of Pennsylvania had any bearing on the discoveries of lead and zinc in the great Mississippi Valley. But, on the other hand, there can be traced a very intimate relation between the finding of gold, silver, copper, and lead in the Rocky Mountain states and the search for gold in California: the pioneers en route to the coast were the discoverers and settlers in Colorado, Wyoming, Utah, and Montana. Figures are not available for arriving at such striking or reliable conclusions in regard to the world's production of metals other than gold, but there is no logical reason to doubt that such increases have been just as pronounced as in the case of the yellow metal. In fact, there are good grounds for assuming that the figures for silver, lead, iron, and zinc would show up even more spectacularly; while with coal, we know that we are now in the greatest period of the world's production. The United States leads the world in the production of the base metals, such as copper, iron, manganese, lead, and zinc, taken collectively or separately. Our country stands second in the production of the precious metals, gold, platinum, and silver. We have the greatest variety of mineral products, as well as the greatest production of complex ores, or those carrying more than one valuable metal. We produce more copper than the rest of the world combined. Although we stand in second place when considering the production of gold, we still possess the Homestake mine in the Black Hills, famous as being the gold mine with the greatest tonnage in the world; and the Camp Bird mine, in the San Juan district of Colorado, famous the world over for its highest average value of gold ore. This great mine is now nearly exhausted and is about to close down after making a wonderful record. South Africa produces the greatest amount of, and the purest, natural gold in the world. Great Britain has an insignificant production of both gold and copper, and still it is noteworthy that the English-speaking nations control the world's production of both these metals. 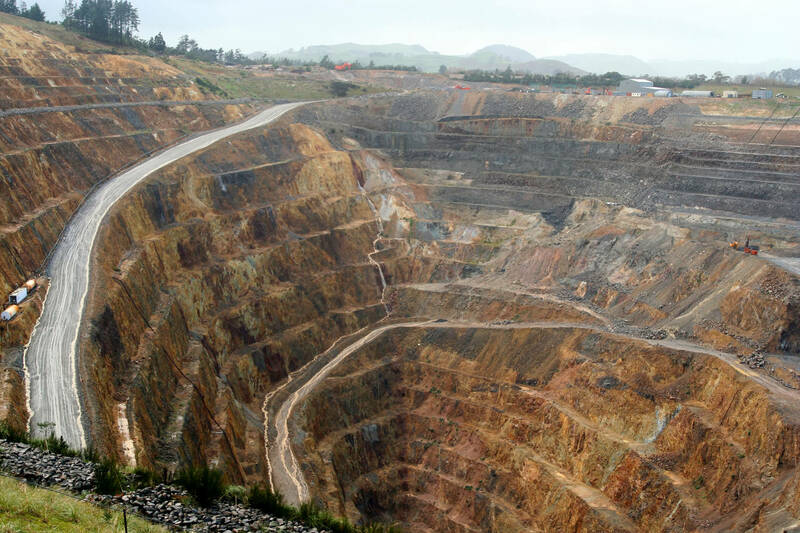 British and American citizens own seven-eighths of the world's gold mines. England stands second in the consumption of copper, which, of course, is mainly imported. Russia controls the world's output of platinum, with very little competition. In a similar manner, Canada has the control of nickel production. Mexico, although not commonly regarded as a gold mining country, is rapidly coming to the front and possesses the Esperanza mine, said to be one of the most profitable gold mines in the world. To more emphatically show the importance of the mining industry, especially in our own country, the following facts are taken from 1900 census returns: Agriculture produces annually about $725 per capita; mining, $1,910; and manufacturing, which is dependent upon the others, $760. The National Banker has said: "Statistics show that the combined dividends paid by the gold and silver mining companies of the United States are greater than the combined dividends paid by all of the banking institutions of the country; and the combined dividends paid by the copper mining companies of the United States exceed the combined dividends paid by all of our railroads." There is one thought that will always comfort any person who is engaged in furthering legitimate mining: Wealth acquired from a mine is not wrested from any being but Mother Earth, and it is not, therefore, in the class with the much discussed "tainted money" that is said to be wrung from unfortunate human beings. The gold production of the world took a sudden drop in 1900, but it immediately resumed its upward climb. During the decade from 1900 to 1910, this production increased over 81 per cent. There is a remarkable similarity noticeable in the gold productions of the United States during the years 1910 and 1911. Without the notable increase in the gold output of the Transvaal in 1911, the world's total gold production for that year would have shown a decrease. The silver production of the United States remained practically unchanged during 1911. Following references were added to this page by Mr. Jean Louis, mentor to Start Your Own Gold Mine as the resources here had statistics from before more than 100 years.